This story is the second in our continuing series: Communities of Change. 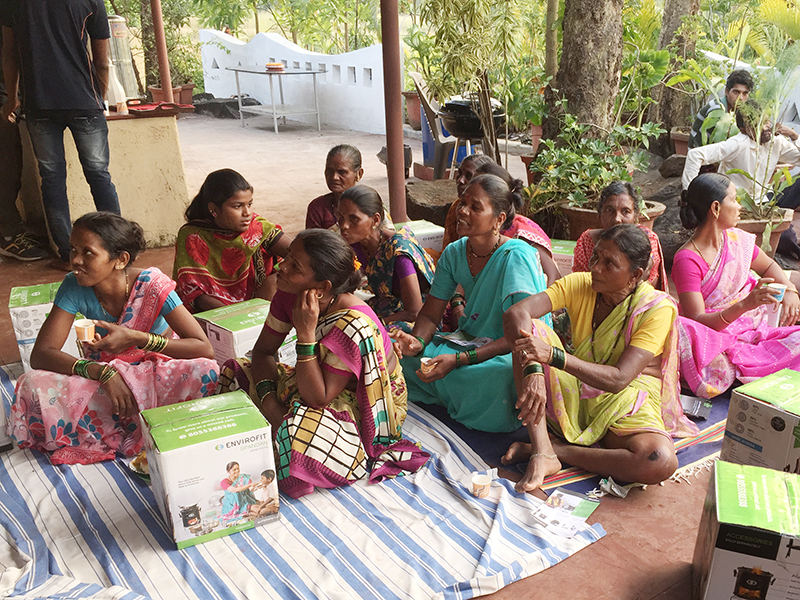 Envirofit India recently worked with an individual to deliver 100 stoves to villages in a project intended to reduce deforestation and generate carbon credits. At his personal request for anonymity, we will refer to him as Our Friend. Monarch butterflies and the sounds of bees and birds fill the air as we walk along tree-lined village roads to Kharkhardi. The area is peaceful and green, untouched by the chaos of city noise or air pollution. What makes this remarkable is that a scant four years ago it lay barren and infertile. Back then, the local villagers accepted the parched landscape because they lacked the resources and agricultural knowledge to rehabilitate it. The story of Kharkhardi’s turnaround, and Envirofit’s presence there is because of one man. “There was nothing at Kharkhardi when I first arrived,” Our Friend said, as he walked us around. “No electricity, no running water, and no functional road. I had to bring each of these into the area – one element at a time. Our Friend saw past those barriers, and the area today bears witness to his efforts to renew the environment around him. Most recently, these efforts have led to the building of a boutique resort in the area, man-made lakes, and planting an astonishing 90,000 saplings in four years. But this change didn’t come easily. When he first began, Our Friend was thought of as a land-grabber, with no interest in the surrounding villages. Deforestation is an issue in Kharkhardi, as it is throughout the world wherever traditional cooking methods are still used. Saplings were planted to combat this, but soon they were cut down by villagers as fuel for their daily cooking needs. At the core of the issue was a lack of trust between Our Friend and the people who lived in the villages surrounding his land. At first glance, yachts don’t seem to have much in common with carbon credits and clean cookstoves. But with the help of some creative thinking, Our Friend was able to put them together. A sailor by profession, the connection began when he brought up deforestation in India during a conversation with his friend Mark Robinson, at Yacht Carbon Offset. Luxury yachts around the world generate a large carbon footprint. Robinson’s company works with yacht owners to direct a portion of their fuel costs toward emissions reduction projects that offset their footprint by generating carbon credits. As it happened, Our Friend’s next conversation on the subject was with Priya Thyagaraj, Envirofit India’s Director of Communications & Social Media. As they spoke, she mentioned the dangers of cooking on traditional chulhas and how it relates to Household Air Pollution and deforestation. When Priya mentioned that Indian households who use Envirofit cookstoves also generate carbon credits, a solution was born. 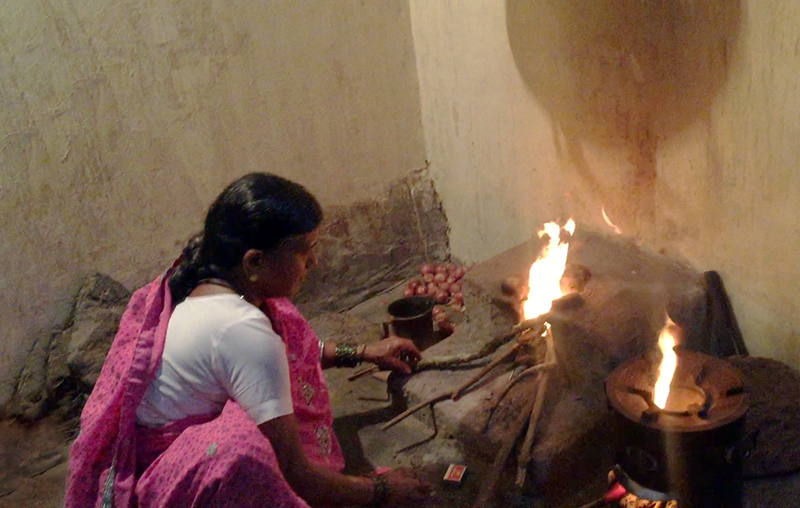 First, Envirofit proposed its clean cookstove, the SuperSaver SPANDAN™ as the right technology to help villagers cook more efficiently and with less fuel. Next, Yacht Carbon Offset paid for the stoves and drew on Envirofit’s Gold Standard carbon credits to provide its services to Our Friend’s yacht company. Finally, the stoves were delivered to the community, which consists of the villages surrounding Our Friend’s resort, under the leadership of Kharkhardi village head Mr. Vajentre. Envirofit India was there the day the stoves were distributed at a ceremony organized by Our Friend. Tea and snacks were set out for the villagers and, as they started to arrive, there was a palpable relief in the air. A solution to local deforestation was finally being provided. 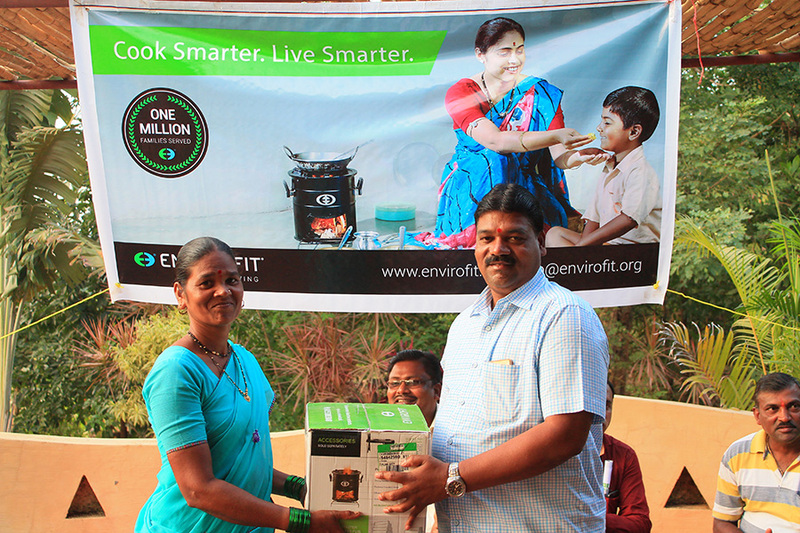 Next it was Envirofit’s turn to demonstrate the capabilities of our clean cookstove. One of our top demonstrators, Mangesh, took to the floor and soon had the audience actively listening to him talk about how the stoves reduce toxic emissions by up to 80%, and use 60% less fuel. One could almost feel Our Friend relax as women came up to get their new cookstoves. By choosing to cook on an Envirofit stove, each household would be helping to preserve the natural resources around their village. By reducing the fuel needs of 100 households by 60%, it is expected that many more of the saplings will keep growing for years to come. Our Friend has a vision that Kharkhardi will continue to remain green and the trees will flourish. The success of his reforestation project will be the legacy of one man who saw beyond barren earth, and the hard work of everyone involved to see it through. Envirofit India is proud to have played a part in reaching more families with improved household energy while helping preserve our environment.